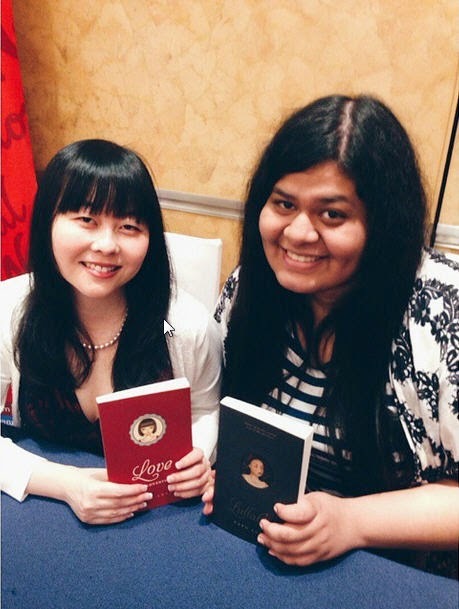 When National Bookstore announced that Lang Leav was coming to Manila for a book signing, I was excited (but seriously... who wasn't?) and I eagerly anticipated the day wherein I could finally meet her. I'm not exactly that big of a poetry fan, but I absolutely adore Lang's poems. They're all so raw and heartbreaking! There were a storm throughout Lang's stay here in the Philippines, and as a result, one of the legs of her book signing tour was cancelled. The Manila leg, however, pushed through, and man, you should all see the sheer number of people who braved the storm warning just so they could meet Lang! She doesn't have a particular technique - rather, she writes from instinct. In the recent years, she had worked on developing her writing in order to make it more compact, but she also worked on keeping the emotion in her writing. Now, it all comes naturally. Lang doesn't really have a writing process - she just writes when she can. The success of Love & Misadventures was a big help in the publishing of Lullabies. By then, Lang was very secure with her publisher, and she didn't have to go at things alone. When asked whether there was a time wherein she felt she had to choose between her writing and her art, Lang reiterates that she has always gone with her gut feel and based her choice on what was currently working for her. When her writing took off, it was clear that it would be the frontrunner based on the response she got. When asked whether there was a time wherein she felt that something she had written was rather similar to something else she had written before, Lang said that yes, she does experience that sense of deja vu. She then thinks whether or not the two pieces of work were just too similar, and she also talks about the importance of finding a balance. Lang will have another poetry book out in 2015. She is also working on a novel, though she is not exactly sure whether it we be released next year or not. Lang loves it when readers have their own interpretations of her poems. Lang considers the notion that people can see themselves as the protagonists when reading poems the beauty of poetry. For my question, I asked whether or not there was a specific moment or person that inspired Lang to write poems. Lang doesn't think there were specific moments or people, writing poetry was just something that she has always done. Writing has always been her way of getting her feelings out, and she tends to be more prolific when she is going through a tough time. Lang is surprised by the popularity of her poem Souls. She wrote it when she was a in a long-distance relationship - after she and her boyfriend hung up the phone, there would be this horrible silence and this was what inspired the poem. The wisdom that Lang wants to share is: "Words are your power. Never forget your words." Thank you to National Bookstore for hosting yet another successful book signing event. This year was a year full of bookish events, and I honestly couldn't be more thankful!